Investing for "the Long Run"? In a Feb. 25, 2009 Financial Times piece Insight: The flight of the long run by Peter Bernstein , he comments that "The unknown today seems more than usually unknown. Then my whole point remains the same. The long run is an impenetrable mystery. It always has been." He also cites John Maynard Keynes' observation about the future: "We simply do not know." 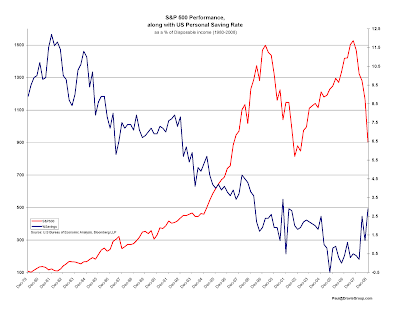 After reviewing data related to changes in US Personal Saving as a percentage of disposable income over several years, it seemed interesting to compare that trend with the performance of the S&P 500 over an extended period. The chart presented here is based on quarterly data from 1980 through 2008. The red line is the S&P500, while the blue line is the saving rate (the high: 12%, the low: -0.5%).